Southern senior Abby Cummins (14) tips the ball over the net, during the Lady Tornadoes victory on Tuesday in Racine, Ohio. Wahama senior Alexis Mick (31) spikes the ball over Southern’s Sydney Adams (left), during Tuesday’s TVC Hocking match in Racine, Ohio. RACINE, Ohio — Sending the seniors out in style. 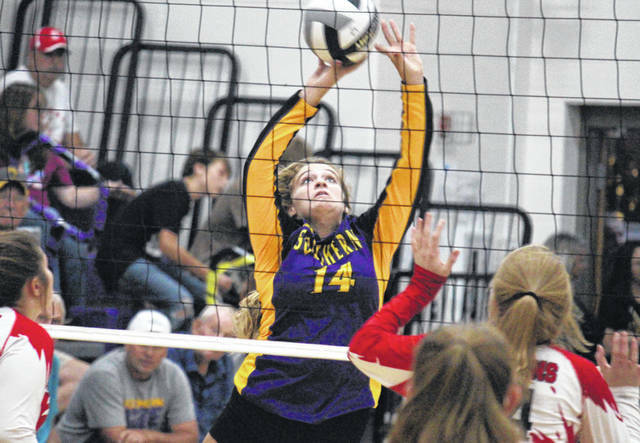 In their final home game of the season, the Southern volleyball team claimed a straight games victory over Tri-Valley Conference Hocking Division Wahama on Tuesday in Meigs County. Southern (5-14, 5-11 TVC Hocking) began its senior night game with a wire-to-wire 25-14 win in Game 1, finishing the set with an 8-1 run. The Lady Tornadoes scored the first six points of the second game, and stretched the advantage to as many as 10 points, at 18-8. Wahama (2-14, 2-14) fought back to within two points, at 22-20, but Southern scored the three markers to take the 25-20 win. The Lady Falcons earned their first lead of the night by scoring the first four points of the third game. SHS tied the game at five, seven, 16 and 17, before finally taking the advantage at 18-17, as part of a 6-0 run. WHS cut the deficit to one point, at 22-21, but Southern scored the next three points to take the match-sealing 25-21 win in the finale. Following the victory, SHS head coach Kim Hupp was happy with her team’s energy, and that they got the sweep on senior night. “The girls came out and played well tonight,” Hupp said. “We had some unforced errors in the third set, but we were able to overcome that and finish with the win. For the Lady Falcons, head coach Matt VanMeter noted that his team is dealing with reoccurring issues, and balancing the difference between playing in two states. “It’s the same thing we’ve seen all year, out of position and we’re not staying low,” VanMeter said. “We’re playing too big, and in volleyball you cant play big and still come up with digs, you can’t move as well. For the match, SHS finished with a 48.3 side-out percentage, while Wahama’s was 38.4. 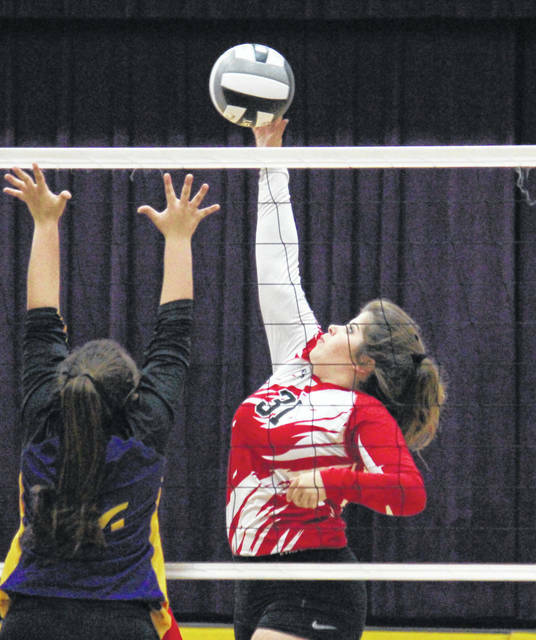 The Lady Tornadoes earned a 94.5 serve percentage with 10 aces, while The Lady Falcons had a 91.4 serve percentage and a quartet of aces. 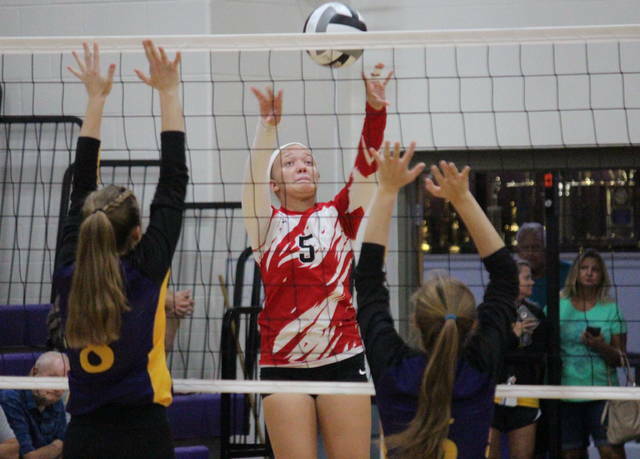 Sydney Adams led the Lady Tornado service with match-highs of 13 points and four aces. Peyton Anderson was next with 11 points and two aces, followed by Baylee Wolfe with 10 points and three aces. Phoenix Cleland contributed seven points and an ace to the winning cause, while Baylee Grueser and Marissa Brooker chipped in with two points apiece. Gracie VanMeter led the Lady Falcons with nine service points, followed by Alexis Mick with seven points and an ace. Logan Eades and Harley Roush finished with four points apiece, to go with two aces and one ace respectively. Bailee Bumgarner and Hannah Billups rounded out the WHS service attack with three points apiece. At the net, Wolfe posted 19 kills and a pair of blocks for the Purple and Gold. Cleland and Mickenzie Ferrell earned six kills apiece, with Cleland adding a pair of blocks. Jordan Hardwick had three kills in the win, Saelym Larsen finished with two kills, while Brooker picked up one kill and a match-best 18 assists. Emma Gibbs paced the net attack for the guests, earning six kills and two blocks. Gracie VanMeter had three kills and a team-best 10 assists, Mick, Billups and Eades added two kills apiece, while Roush and Lexi Layne came up with a kill apiece. 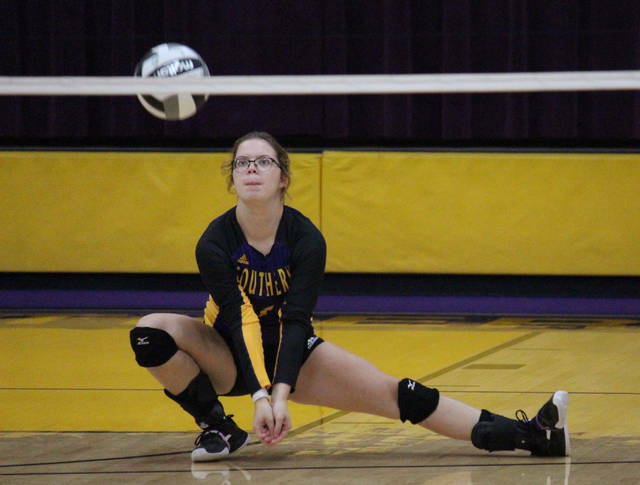 The Lady Tornadoes also defeated Wahama on Sept. 18 in Mason, by a three games to one tally. Southern wraps up the regular season on Thursday at Jackson. Wahama has a week off before traveling to Point Pleasant on Tuesday.